Dealing with late payments from a customer is simply no fun. And when your client is a chronic offender, financial tardiness is more than just annoying. Consistently late payments can severely curb your cash flow and put your whole business at risk. Here, we delve into how you can use your invoice to avoid late payments. And if your invoice doesn’t work, we examine what you need to do to collect on those past-due payments. We’ve said it before, and we’ll say it again. Nothing gets you paid faster and more reliably than sending your invoice as soon as it’s due. Whether your payment cycle is weekly, monthly or something else entirely, stick like Velcro to your agreed-upon schedule. Speaking of payment schedules, make sure you and your client agree to one during your initial contract negotiations. Put all the terms in writing so there’s no room for misunderstandings about deadlines or late fees. Experts say the payment deadline “sweet spot” is 10 to 15 days after receipt of an invoice. A standard late fee is 1-2% of the total amount due. Whatever penalty you choose to enforce, make sure it’s steep enough to change your client’s bad behaviour. If your business has recurring customers, keeping their credit card on file can minimise payment headaches for both of you. Just be sure to get permission in writing to charge the card, and make certain you store their private information safely and in full compliance with PCI standards. If you’re sending invoices using an online financial management platform, you can set up automated, direct payments from an approved credit card. If you’re really strapped for cash, you might seek out a special type of loan for the amount you’re owed, or due to be owed. Known as invoice factoring or invoice financing, such loans are possible if your invoices are due and payable within 90 days and the businesses you work with are reputable and have good credit scores. The money you borrow through invoice factoring is equivalent to a loan, but the fees or interest varies depending on the provider. Factoring can be a great solution if you’re a fast-growing company that needs to free up cash from your outstanding invoices. Some factoring companies will even take on collections, chasing up your late payments for you. Some customers are notoriously nonchalant when it comes to paying what they owe no matter how punctual, professional or pretty your invoice. Here’s a roadmap for tracking down your money. For this example, let’s assume you’ve agreed payment is due on the 1st and 15th of every month. Your money is more than two weeks late. Time to send your customer a polite reminder. A good opening line for your communication? You’re just checking in to make sure the client received your invoice. Or consider this approach: since your second payment of the month is about to come due, send that invoice and include the original outstanding amount too. We know you’re frustrated, but skip the email missive and pick up the phone to find out how you can expedite the payment process. Emphasise the specific due date—and remind your client about the agreed-upon payment terms. If it’s possible to have this conversation in person, schedule a meeting ASAP. Take a moment to send one more reminder, just in case your invoice has been moved to the next month’s “payment due” pile. If there’s no response, you might consider connecting with a collections agency. Unfortunately, radio silence may indicate your client has gone out of business. In this scenario, it may be time to cut your losses and assess what you can do differently to avoid this trying situation in the future. 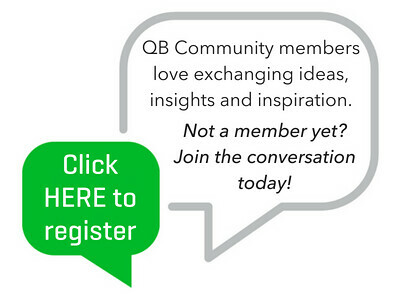 QB Community members, have you had to “retrain” customers so they’re punctual with every payment? Please share your stories – and your strategies for success below in the comments! Want to join the conversation? But not yet a QB Community member? Click HERE to sign up in a flash! There really is nothing worse than tracking down late payments! Anything you can do to minimize the risk before those invoices go out is well worth my time. Great article! I just wanted to add that we use Satago (which is free!) to manage debtors for a lot of our clients. Awesome info, @EmilyMockett - thanks for sharing! 'Send your invoices on time' and 'Negotiate terms up front' - both are these are things I use when I collaborate with brands through my freelance writing business. Hi, @pioneerSC204 ! I would love to know how you deal with late payments? How do you ensure your customers pay on time? Comment below! I hope you're doing well how is your business this week, have you been busy? Also, @Karsty.. Have you ever had to deal with late payments? Or do your customers pay before you do their gardening? How do you deal with the payments from you customers? I have a couple of late payers, one is always late, very late, but always pays. I just treat them on the same level as a fellow human being. One is apparently experiencing hardship, but still pays what they can. I am just straight, compassionate, reasonable, and honest with them. They continue to pay me when they are able. Years ago I sold some customers to a small company and they did not pay me in full. I kept trying to get the money, but it fizzled out. They still owe me about £3,000. I stopped badgering them because the wife was the secretary and was really nice, they had young kids, and the husband seemed to a be a bit of an erratic nutter. I just left it alone in the end because I felt sorry for her and her kids. The husband was the " bread winner". Thank you for the awesome reply. It's really great to have your insights on this! Do you use a supplier for your plants? How do you source these? Also, that's terrible to hear @Karsty - what changes will you now make going forward? How can you prevent this from happening again? Being compassionate and reasonable is a great way to be, I am sure that adds a unique edge to your business. You certainly have patience and that's a great asset to have. I know that when I have finished some freelance work, I am always quick to send invoices and have a deadline date set in stone... However, it doesn't always run smoothly. With the nature of my work, I get my clients to sign a pre-agreement before the work is produced to ensure they will pay on time or I set up a direct debit/standing order from their account... But I know things aren't always that easy! Don't say sorry, it's amazing to have your contribution to the UK QB Community! Your experiences will help others in their business journey too.